Here's a link to the the Democracy Now! 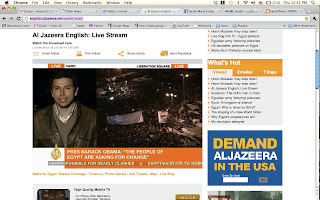 TRANSCRIPT I helped transcribe and type up for Feb. 11, 2011 live coverage from Cairo. Please share. Also, my friend, Liam Stack is celebrating in the streets with the rest of Cairo and Egypt in a video here! Amazing positive energy and chanting "Enough ~ the people made the regime fall!" Finally, "Hey hey -- ho ho -- THE PEOPLE MADE MUBARAK GO! Ain't no power like the power of the people because the POWER OF THE PEOPLE DON'T STOP!" Footage from our Austin Rally for Solidarity with the Egyptian People is here. Everyone keeps asking what's next?! Mohamed ElBaradei, Egyptian opposition figure; Ayman Nour, former presidential candidate, Al Ghad party; Adhaf Soueif, Egyptian writer and political commentator; Catherine Ashton, EU foreign policy chief; Hossam El Hamalawy, pro-democracy campaigner; Ali Abdel Wahab, pro-democracy campaigner; & Barack Obama give their two cents here. Today's impressions from Cairo via Jadaliyya.com. POWER TO THE PEACEFUL #EGYPT! "We are living and breathing history," Al Jazeera reporter just said on Live Stream. This movement is unprecedented. Inshallah, Egyptians will have true representation and no longer live under Mubarak and his regime's repression after tonight. One step at a time. Reform is near! Hopefully, it will be a peaceful transition. 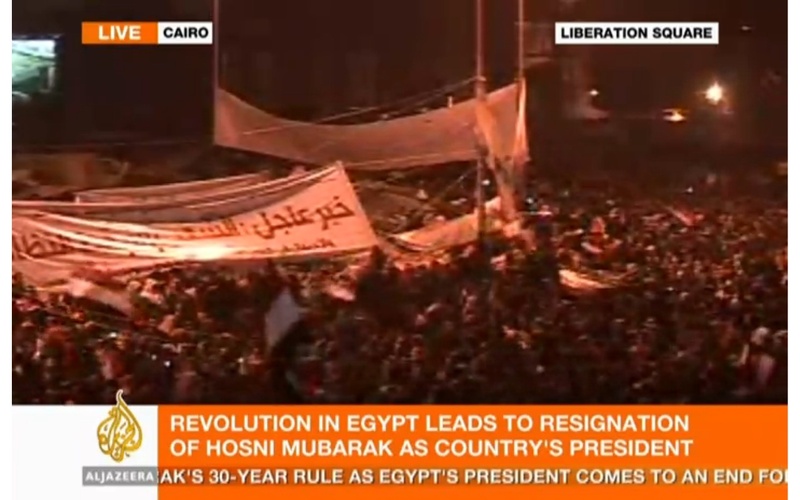 Mubarak is a symbol of 30 years of dictatorship, corruption, and tyranny! My photo in ABC News to show solidarity for Egyptians here. No more oppression, occupation, corruption, convolution! Only through social justice movements and via the power of the peaceful can human rights be realized. Self-determination is a basic human right for all and I especially hope it is realized among my Egyptian, Tunisian, Palestinian, Jordanian, Lebanese cousins! Excellent live reporting from Sharif Abdel Kouddous from Democracy Now! Tahrir #Egypt anticipating a peaceful transition and reform. Nawal Al Saadawi wants Mubarak to stay in country so he can be tried... not a bad idea! Why Egyptian aka Papyrus Revolution is not about Islam. Apparently Mubarak is NOT listening and instead delivered a patronizing speech! Protesters still shouting: "We will not leave, he will leave!" HARAM! WAVE YOUR SHOE IN DERISION! My Georgetown University professor, Samer Shehata, is interviewed here on PBS. Totally was/is a contributing tool to the ongoing revolution. Jadaliyya.com gets it right here. But this has certainly been brewing for over a decade... in related news Syria Opens Facebook, Youtube, first time in five years. DemocracyNow!, I have to take a moment to say, has done excellent coverage in English over the past two weeks on the developments of the Egyptian revolution. Al Jazeera Arabic & English and BBC Arabic are great sources too but thank you producers of DemNow! for disseminating necessary information among Americans and throughout the blogosphere. Sharif Abdel Kouddous is on point with questioning activists on what exactly they are calling for in this interview. * The Papyrus Revolution quote of the week: "The longer it lasts, the more beautiful and creative the revolution becomes." Power to peaceful right to assembly #Egypt! Some photos from a twitter friend in Cairo complied on Feb. 9 here. Will leave you with some powerful spoken word from Palestinian-American poet and playwright, Suheir Hammad. LOVE & POWER TO THE PEACEFUL! Nomadic by nature. I am from D.C. but first gained consciousness to this world as a toddler while living in Jordan. I love the West Bank and Palestine and am compelled to exploring while respecting our international human rights and social justice.